The native name of this figure is Melang. Dr. Furness obtained it from a native woman called "Lemet," who was a "Mispil" (a woman of the long-house) in the village of Dulukan in Uap. 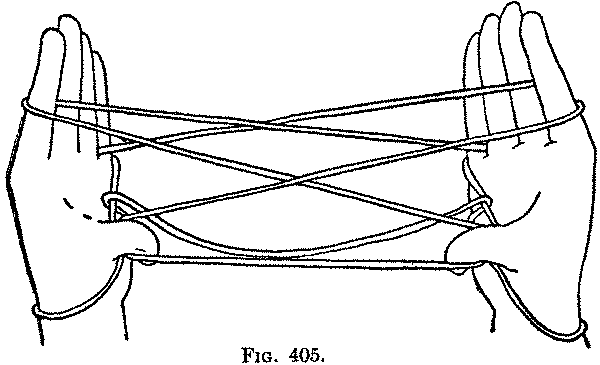 Second: Turn the hands with the palms toward you, draw the strings tight and close the four fingers on the palm over all the strings except the near thumb string (Fig. 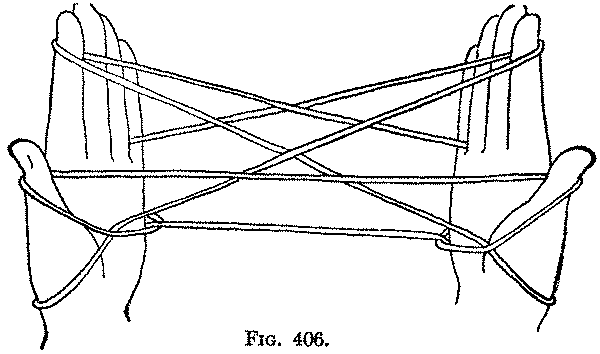 401). Now, by turning each hand down and then up toward you under the near thumb string, you can put this string on the backs of the four fingers. Unclose the hands (Fig. 402). 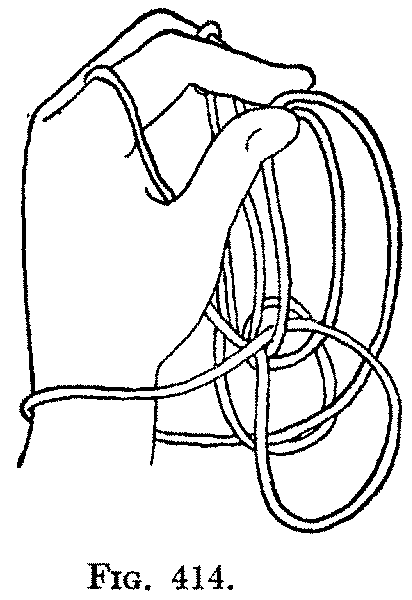 Third: Pass each thumb up on the far side of the string which, passing between the thumb and index, crosses the back of the four fingers, and let the loop slip down on the wrist (Fig. 403). 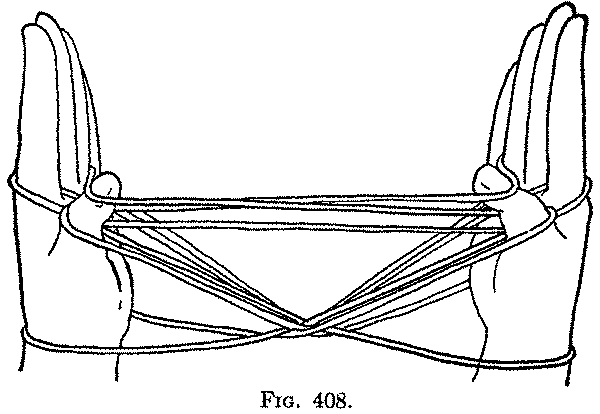 Fourth: Incline the hands slightly toward each other, and keeping the strings tight, turn the palms away from you, and pass each thumb under both the near and far wrist strings (Fig. 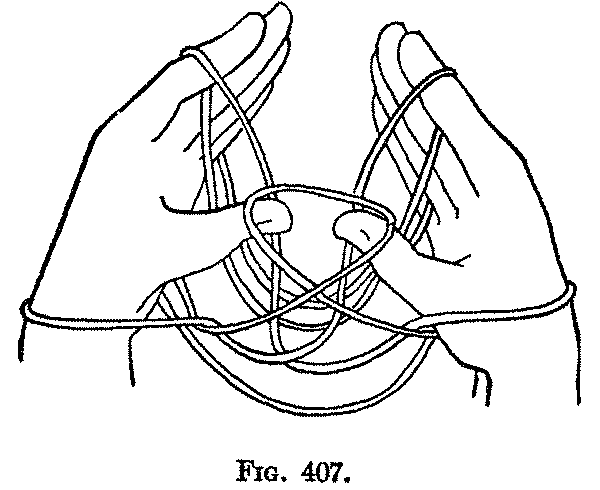 404), and up into the little finger loop, then catch each far little finger string on the side of the thumb and, turning the palms toward each other (Fig. 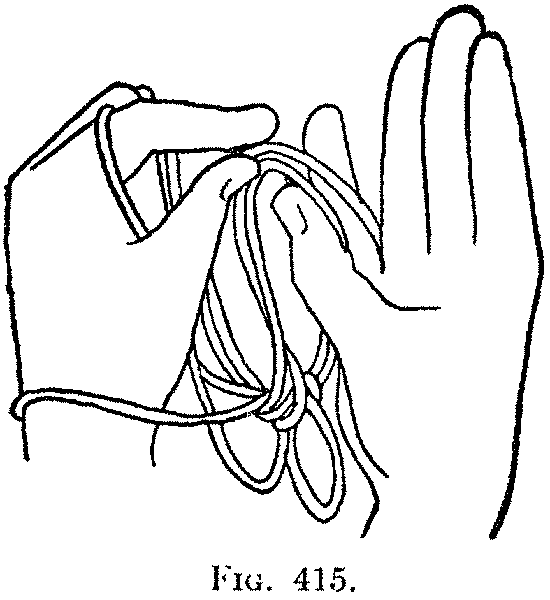 405), draw it toward you on the back of the thumb under all the strings as you return the thumb to its position (Fig. 406). You now have on each hand: a loop on the thumb, a loop on the index, a loop on the little finger and a loop on the wrist. 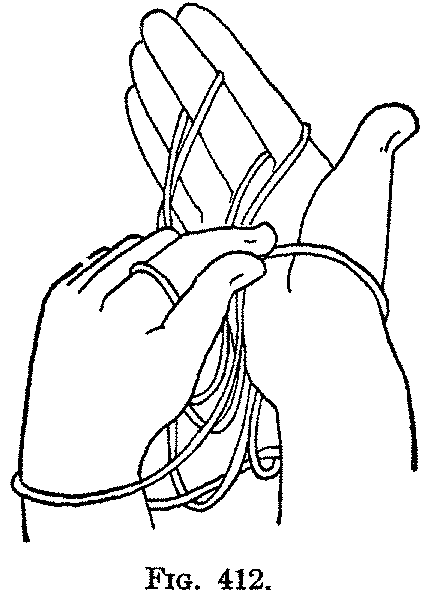 Under the wrist loop passes a string formed of the near thumb string and the far little finger string. Fifth: With the thumb and index of the left hand put the right thumb loop on the left thumb without twisting it, and with the thumb and index of the right hand put the left thumb loop on the right thumb without twisting it. 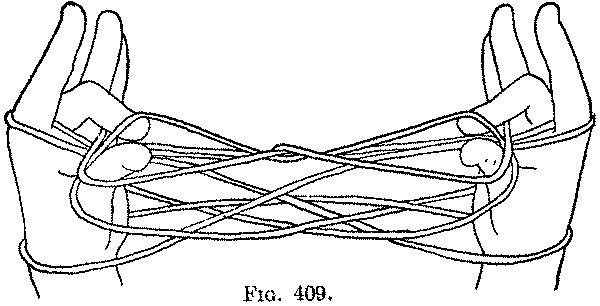 This movement simply exchanges the thumb loops (Fig. 407). 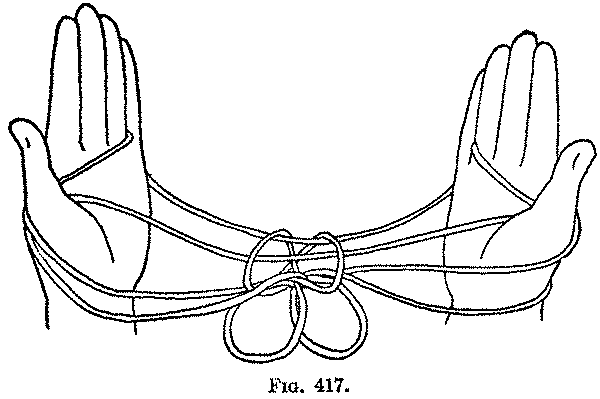 Sixth: Pass each thumb away from you over the far thumb string and both strings of the index loop, and take up from below on the back of the thumb the near little finger string, and return the thumb to its position (Fig. 408). Seventh: Bend each middle finger down over the palmar string and both strings of the index loop, and take up from below on the back of the middle finger the far thumb string (not the palmar string) (Fig. 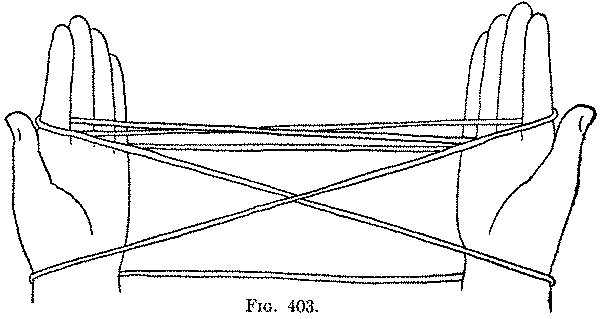 409), and return the middle finger to its position (Fig. 410). 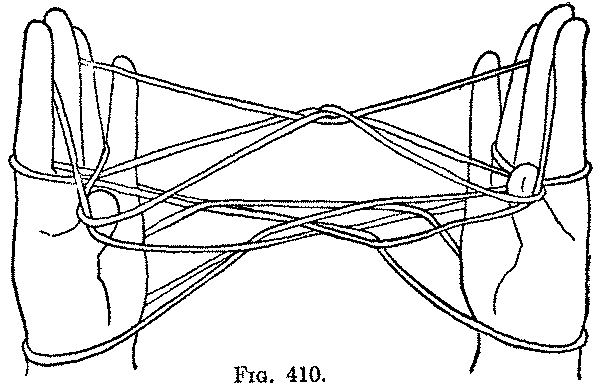 Eighth: Release the loops from the thumbs and little fingers and draw the hands apart, but do not draw the strings too tight (Fig. 411). You should now have a loop high up on each middle finger, a loop around the base of each index and a loop on each wrist. The central figure has the shape of a kite; it should be large or the final figure will not be successful. Ninth: Turn the hands with the palms up, and with the left thumb and index pick up from the edge of the right wrist the right near wrist string (Fig. 412), and, slipping it out over the thumb and index, place it on the middle finger beside the near middle finger string (Fig. 413). 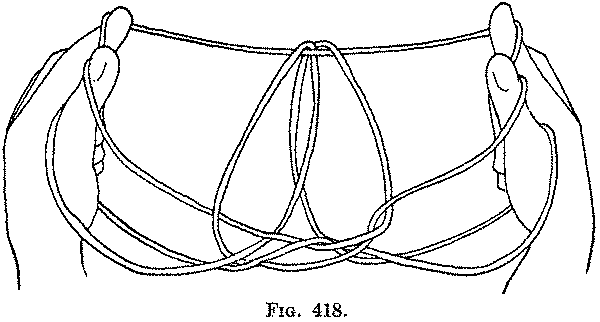 Now, with the left thumb and index pick up it both these strings from the right middle finger, and slip the right hand out of all the loops (Fig. 414). 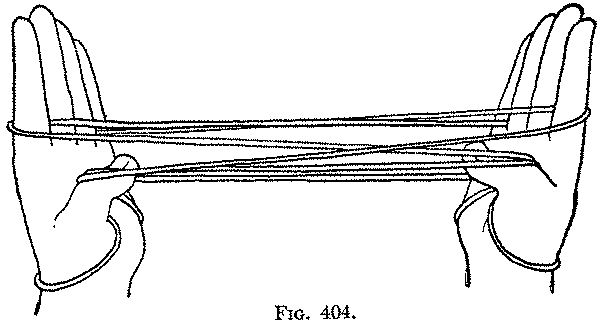 The left thumb and index are now holding two hanging loops; one loop is large and projects farther to the right than the smaller one. Put the right little finger away from you through the wide loop only, and put the right thumb away from you through both loops (Fig. 415), and turn the hand up. You now have a loop on the right thumb and a loop on the right hand in the "First Position" (Fig. 416). In the same way turn the left hand with the palm up, and with the right thumb and index pick up from the edge of the left wrist the left near wrist string and lay it on the side of the left middle finger beside the left near middle finger string. 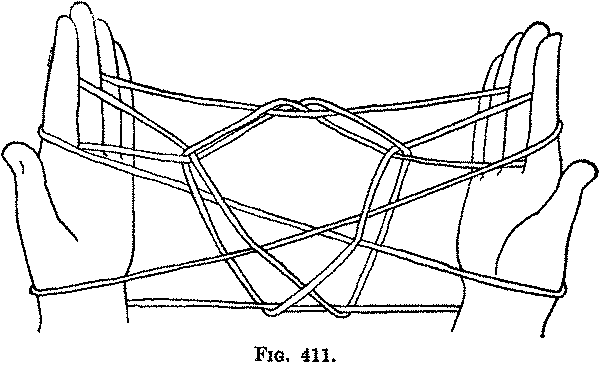 Now with the right thumb and index pick up both these strings, and withdraw the left hand from all its loops. 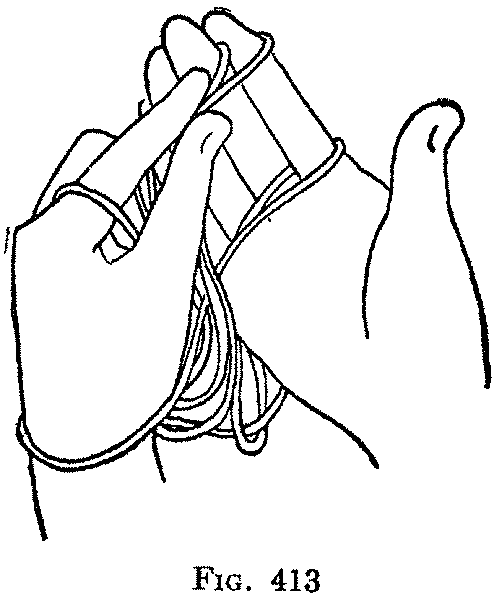 The right thumb and index are holding two hanging loops; put the left little finger away from you through the wide loop only, and put the left thumb away from you through both loops, and turn the hand up, but do not draw the strings tight; only sufficiently to pull out any hanging loops (Fig. 417). Tenth: Bend each index finger down and hold the far thumb string between its first joint and the first joint of the thumb; then pick up from below on the side of the tip of the index the far thumb string (not the palmar string) (Fig. 418). 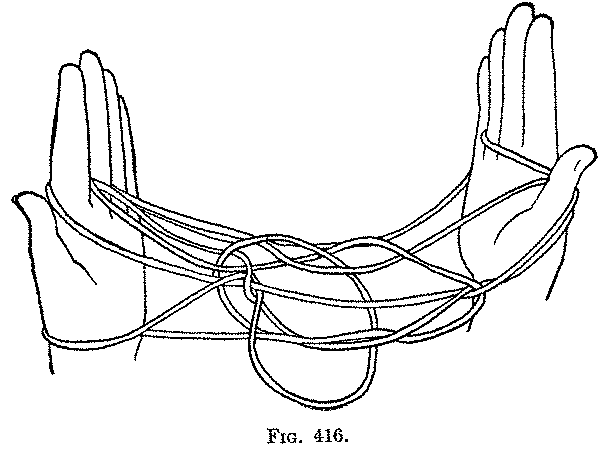 Now, holding the thumb close to the index, curve the index toward you and up, at the same time turning the palms away from you and holding down the far little finger string with the middle, ring and little fingers of each hand (Fig. 419). Separate the hands and draw the strings tight. The final pattern is difficult to form and requires practice. Some working of the strings is usually needed at the end of the last movement to bring out the branching "Coral." 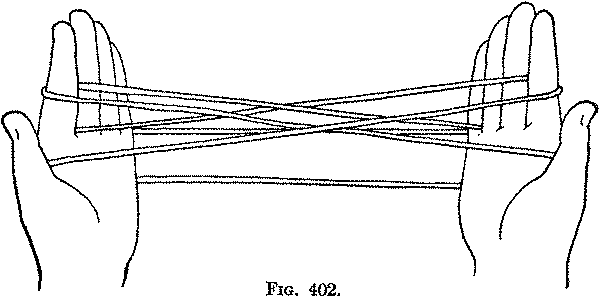 In this figure the Second movement is like the movement in the "Leashing of Lochiel's Dogs." The method of catching the far little finger string, seen in the Third movement, is peculiar to this figure. You have probably noticed that the thumb loops exchanged in the Third movement are not similar to finger loops exchanged in preceding figures, because the same string forms the far string of each thumb loop. The Ninth movement is not very unlike the Eighth movement of "Three Stars."